This week I went up to Boston to speak at AIIM’s New England chapter. While I enjoyed speaking about the cloud and how AIIM is using it, I enjoyed talking to the people more. I’ve always enjoyed attending events like this. Whether it is a random meet-up group, a local AIIM chapter, or one of the bigger seminars/conferences, talking to people the best way to keep a finger on the pulse of the industry. When I was a consultant working with multiple clients, I would be very focused on a subset of the industry from both a technology and business perspective. Getting out and trading war stories with others was a great way to learn, let off steam, and to make sure that I never lost sight of the bigger picture. I didn’t get where I am today by just working in the content industry. I as far as I have by getting out there and learning from others. In fact, the local connection is the ultimate in learning and networking. Social networks are great, but they have limits. Twitter is very good for connecting for new people in the industry and tracking what is happening outside of your project’s bubble. It is work though to find all the right people to follow and make sure that you are getting the right balance of views. That is where local comes into play. You interact with people in an environment where they are more genuine and less scripted. It is a good way to meet people follow in social media and to find people that can give you real advice. Advice delivered 140 characters at a time is limited. Discussions without body language cues may miss critical issues or topics. When you throw in serendipity that comes with meeting new people, the value skyrockets. There are lots of ways to get that local love in the Content Management space. AIIM has a lot of chapters spread throughout the US and Canada. There are local AIIM seminars in the spring and fall. Even the AIIM Conference is a great place because while it may not be local, it will have people in various industries from around the world gathered to chat. 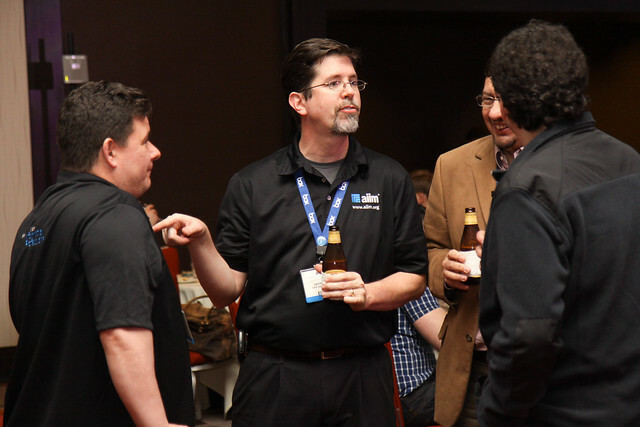 Outside of AIIM, there are local meetups of various specializations. Heck, even your school alumni group isn’t a bad place sometimes. If you are stuck in the middle of nowhere, there are a few online alternatives. They aren’t as good as a physical meeting, but they are better than just hanging out in the social media world. There are chats on Twitter that you can participate in on a regular basis. The participants of those chats usually are great people with which to connect and engage. In the Information space I try and participate in #InfoChat Thursdays at 11AM EST. When I want to talk about the business side of Associations, I participate in #AssnChat Tuesdays at 2pm EST. There is a chat on probably every topic. Seriously. Go out and meet people. I’m going to the AIIM Conference in March. Did I mention it was in New Orleans? I’ve only been there once before but it was, “The. Best. Conference. Ever.” I’m not going because I work for AIIM, I’m going because of the people attending. Okay, I have to attend but I would fight to go if I was told to stay home. If you are in the Association space, maybe you can see me at the Avectra User Conference in March down in Orlando. I’m going as normal attendee to meet fellow users and see what I can learn. There will be lots of other local events in the DC area I always try and attend. I’d like to attend the National Capitol chapter of AIIM but it conflicts with my duties as a Scout leader for my son. That shouldn’t stop you. Until we cross paths, see you on Twitter and feel free to swing by #InfoChat one day.